StickerYou allows you to make and order die-cut custom stickers in any size, shape and quantity. You can upload your image or logo, or create and customize from thousands of images and/or use our Sticker Editor. Browse the categories below and find just the right application for your stickers. All your custom sticker orders are printed on the highest quality weather-proof vinyl materials. Stickers that you can fully customize are a great tool for both personal and professional use. At StickerYou we fully believe in making your custom message stick in any way you’d like. No seriously, whatever size, shape, colour, design, message, picture, material, occasion, quantity, and anything in between, StickerYou has made it easier than ever before to make your custom stickers exactly the way you want them (we’ve even made it easy for you to find your best sticker type). Dishwasher safe, microwavable, and waterproof, our custom stickers make it stick – absolutely anywhere you need them too. Get the most bang for your buck with die-cut sticker pages. With die-cut sticker pages, you can fit all the stickers you need on one page. An efficient way to save some coin if you need multiples of your custom stickers. Simply upload all your images into our editor, tell us how many pages you need, and you’re done. Since die-cut stickers on pages remove easily, they are perfect if you have a lot of decorating to do for a special celebration or party, need several types of labels for your products, or if you need a simple way to get some eye-catching office décor. Die-cut sticker singles are individual stickers that are cut to be the exact shape of your design (no basic squares or circles here). Being that our die-cuts are cut to shape, we think they’re perfect for getting custom exact details for a specific event, or for making a statement anywhere (and since our die-cuts are waterproof we do mean anywhere). The mini-version of a sticker-page, kiss-cut sticker singles are your custom logo or design but on one mini page. Kiss-cut sticker singles work best with intricate designs, and specific info because all edges are protected by its vinyl backing. They’re awesome as handouts at networking or events or tradeshows because they’re great for getting the business info you need your customers to know in a convenient size (and without a minimum order quantity, ordering in bulk is a breeze). They also work well for personal use, such as promoting your online following or inexpensive memorable gifts for any occasion. Q: How many custom stickers can I order? A: Absolutely any amount! 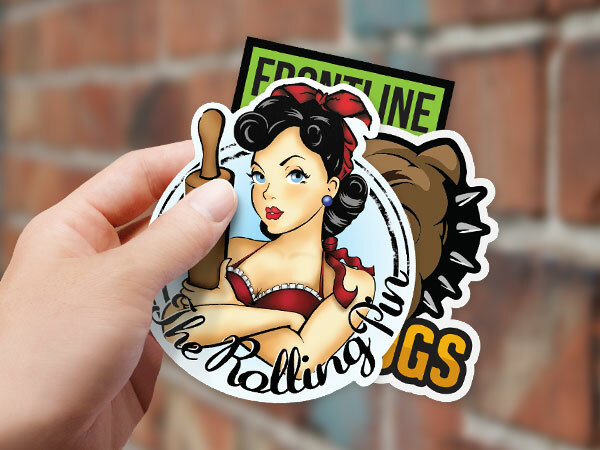 Our customized stickers have no order minimums, and our kiss cut singles can be ordered in bulk, this allows you to see how your logo or design will appear on different materials and will allow you to order accordingly. Q: I need to order a large amount of custom stickers, which option is best for me? A: It all depends what you need them for. 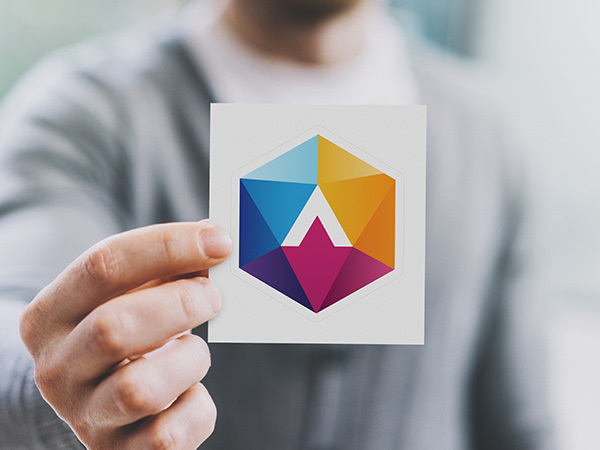 If you’re going to hand out stickers to promote yourself, a business, or an event we recommend our die-cut single stickers and kiss-cut single stickers in bulk because the unique shapes make them stand out and are easy to peel-and-stick anywhere. Our die-cut sticker pages are best if you’re using your stickers for at-home applications or personal use. Q: Can my die-cut stickers have a clear backing? A: Because the vinyl we print our die-cut stickers on is thicker and more durable, our die-cut sticker singles are only available with a white backing. Our custom kiss-cut single stickers can be ordered in bulk in our clear, glossy white, or matte vinyl materials! Q: How many images will fit on a die-cut sticker page? A: There really is no set amount! Depending on the size and quantity of images you want on your die-cut sticker page the amount is up to you! 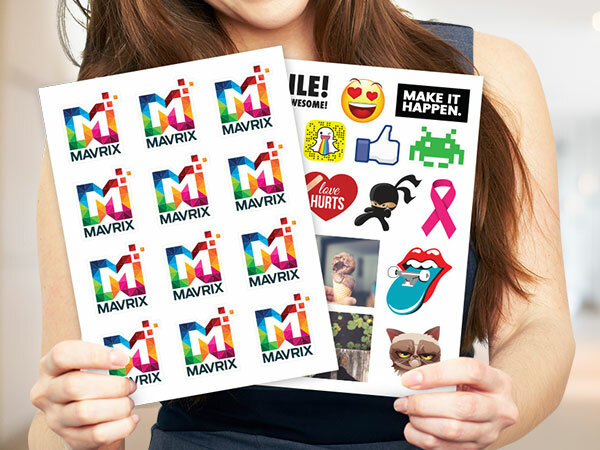 We use a standard 8.5”x10.5” sized sheet so when your images are uploaded to our online editor you’ll be able to change the size and placement of images on your custom sticker sheet. You can make them smaller to fit a lot, or a larger if you only have few. Make some smaller and others larger to have an endless possibility of customized die-cut stickers. Q: Can my custom stickers be used for crafts? A: We think sticker crafts and DIY’s make wonderful gifts and decor. Your customized can be applied to any smooth surface and can be glued or decoupaged in place. Q: I want my custom stickers with both a glossy and clear background, do I have to make two seperate orders? A: Nope! For our die-cut sticker pages and kiss-cut singles you can order multiple vinyl backings that we offer. During the editing process when you’ve finalized your design you’ll be able to choose your custom sticker’s material. From there you can add your quantity to your order and without refreshing the page choose another finish for your custom stickers. Q: How can I make my own stickers on your site? A: The “how to make your own stickers” question is very common and that’s why our platform is so great. Using StickerYou.com you don’t have to speak to a sales rep or wait for a proof. You can upload your artwork and design everything directly on the site and immediately send it to print. Q: What does 'removable adhesive' mean? A: 'Removable adhesive' simply means that although our custom stickers are made to stick on strong and last long, they can still be peeled off if you need to slightly reposition them or want to stick them somewhere else. They aren't going to move on their own, fall off, and never leave any residue when the time comes to remove them.